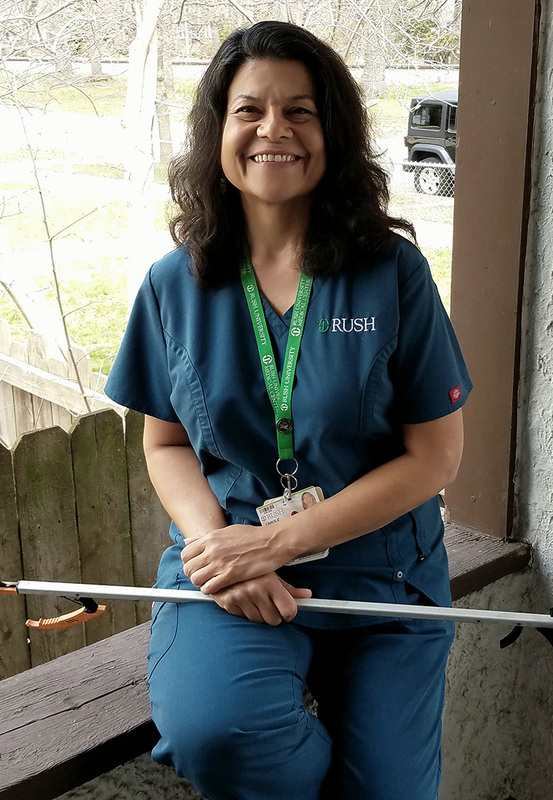 As an occupational therapist for nearly thirty years at the Johnston R. Bowman Health Center (Rush University Medical Center), Carole Hall has devoted her career to helping patients overcome orthopedic injuries. While rewarding, her job can also be very physically demanding. Late last year while helping a patient, Carole felt a sudden pain in her lower back and became concerned that it might be a sign of something more serious. Her hunch proved correct and within the next 24 hours her pain was so excruciating that she ended up in the emergency room. Making matters worse, a few days later she began to lose sensation and movement in her leg and foot, ultimately requiring her to use a cane to walk. Carole immediately arranged an appointment with a physician she trusted: Dr. Kern Singh, a leading specialist in minimally invasive spinal surgery at Midwest Orthopaedics at Rush. Dr. Singh ordered an MRI and diagnosed Carole with severe spinal stenosis (a condition in which bone spurs cause pressure on the spinal nerves) and a spondylolisthesis (when a vertebra slips forward on the vertebra below it). To relieve her pain and regain function of her leg, Carole required spinal surgery. Early this year, Carole proceeded with a minimally invasive laminectomy and fusion on her lumbar spine under the care and direction of Dr. Singh. Through three small incisions in her back (the size of a quarter), Dr. Singh treated the conditions which were putting pressure on her spinal nerves. Following surgery, Carole was amazed by her pain relief. The same day of surgery, she noticed that the shooting pain down her leg was gone. And, after just 10 days, she no longer required any prescription pain medication. She now walks normally without a cane and feels much more like her old self again. As often as she can, she shares her successful recovery story with friends and family, especially those with back pain who have been reluctant to seek treatment. To schedule an appointment with Dr. Kern Singh, call (312) 432-2373.